RIPE Project Associate Director Don Ort discusses field trials that have shown increased biomass in tobacco plants from genetic modification of photosynthesis. 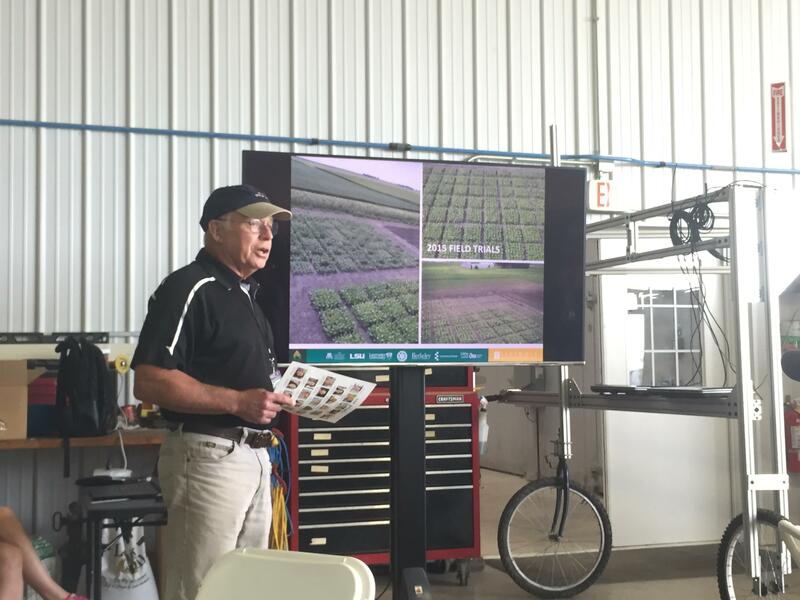 Researchers with the University of Illinois’ crop research project, Realizing Increased Photosynthetic Efficiency -- or RIPE for short -- invited the media and the public to a field day Thursday. They showed off some of their research on increasing photosynthesis in plants, which they believe will in turn increase plant biomass and crop yields. Don Ort is the associate director of the RIPE project and a crop science professor at the U of I. He gave Illinois Public Media’s Brian Moline an overview of the project, starting with the challenges that climate change — or as he calls it, global change — presents to agriculture. A transcript of their conversation is below, lightly edited for clarity. A large, white carbon dioxide tank used to treat crops to simulate a 600 ppm carbon dioxide environment anticipated by 2050. DO: Let's start out with that the UN FAO is forecasting that within the next three decades we're going to need to increase global production by 70 percent. And the way the global change comes into this is that we're going to have to do that with the challenges of global change. And so one aspect of global change is the increasing CO2 concentration in the atmosphere as we're all aware. That in and of itself could actually be a benefit to agriculture because CO2 is the substrate for photosynthesis. Unfortunately, as we all know, as CO2 increases in the atmosphere so does temperature. And so does the evaporative demand of the atmosphere for water that exists not only in the soil but in crop plants. And so temperature in particular based on experiments that we've done here in our Global Change Research Facility at Soy Phase, when we increase the temperature of soybean canopies by 3 degrees through an entire growing season, we see a decrease in yield. And so, this is the opposite of increasing the yield 70 percent. 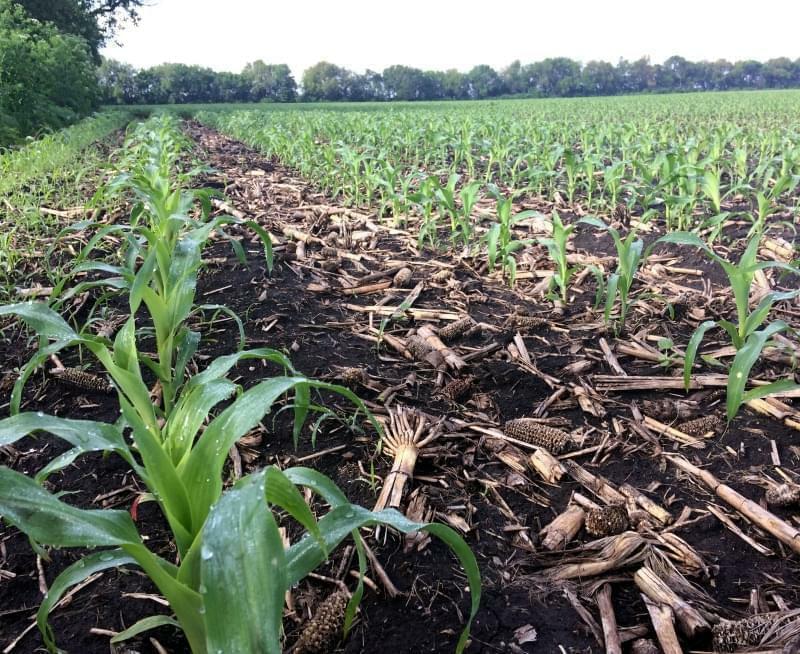 We're going to have to figure out how to make plants more resilient to these higher temperatures just to sustain yield much less to increase it by 70 percent. BM: Now talk about some of the research you're doing here to try and increase photosynthesis in plants. If you could just give us an overview of the process you use to try and do that, to increase the photosynthesis in plants here. DO: And so there's very good evidence that if we can increase the photosynthetic performance of plants that there will be a proportional increase in yield. And plants evolved and photosynthesis evolved in a very different situation than what we have in modern agriculture. So they evolved in a situation of solitary plants and the traits of solitary plants to be competitive is very different than what we want in an agricultural field. A field trial of tobacco plants conducted by the RIPE Project at the University of Illinois. The other thing that's happened is plants evolved, the ancestors of plants evolved in an atmosphere that was 220 parts per million and we’re already 400 parts per million in CO2. And so we need to rebalance photosynthesis in terms of the, the different processes. Since the different processes of photosynthesis had been put out of balance by this increase in CO2 concentration. We know a lot about photosynthesis mechanistically we're able to model it in silico, and those models suggest to us what we need to tweak to be able to increase performance. The way that we've chosen to do this is to use transgenics to overexpress enzymes that we think are limiting. Replace enzymes that are temperature layby with ones that aren’t from different organisms. And in this way, in a in a very organized and structured way, to try to improve performance to these different challenges that are coming up. In doing this we have used model species in order to do proof of concept. 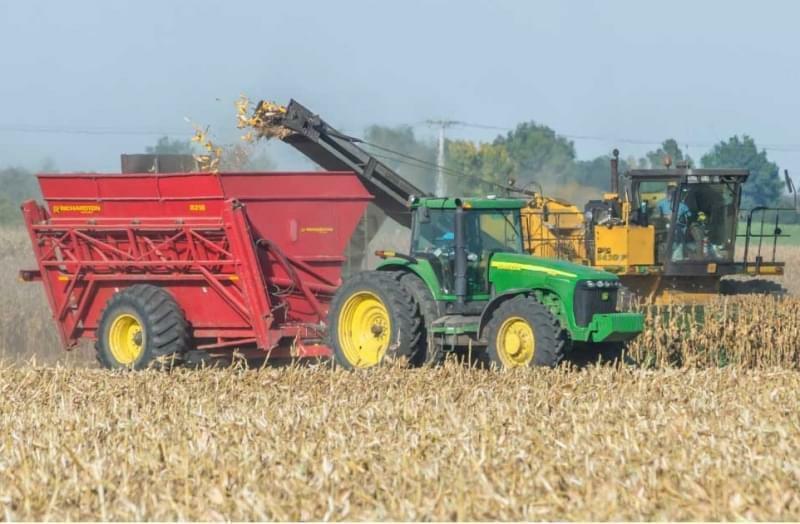 As we get proof of concept in model species, and that it performs in the field, then we start moving them into crop plants, crop plants that we know about in the Midwest, corn and soybean and so on. But also plants that are food security plants in other parts of the world like cassava and cowpea and so on. RIPE Research Technician Kenny Brown shows a cassava root grown in a research plot. DO: A good portion of our research here is funded by the Bill and Melinda Gates Foundation. And they're interested in getting this, in getting improved productivity to the subsistence farmer in sub-Saharan Africa and Southeast Asia. So the crops that are important there are cowpea, cassava. Many people aren't even familiar with cassava, but from the standpoint of production it's the eighth most important crop in the world. It produces more than 50 percent of the calories to keep people alive in sub-Saharan Africa. But it's virtually an unimproved crop. And so we want to help increase the yield of cassava, which hasn't changed in the last three decades. 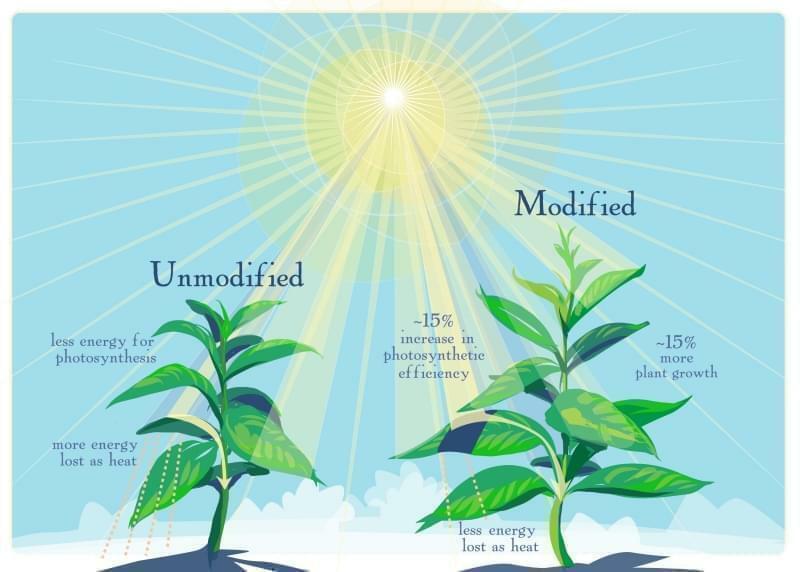 By increasing the photosynthetic performance, again transferring the things that we have validated in model crops. Validated in the field here and then move them into cassava, and anticipate the same kind of benefits that we've seen in our model crops here. BM: How was the U of I able to become involved with the Gates Foundation to bring this research here to Urbana? DO: The University of Illinois has a very long history in the excellence of photosynthesis that goes back probably six decades. And so we were actually contacted by the Bill and Melinda Gates Foundation for a convening. And so, they were interested in an article that Steve Long and I wrote about manipulating photosynthesis as a strategy to increase yield. And they asked us to gather a dozen experts around the world, come to Seattle and talk to them about it. And so that's what we did. A few months later they contacted us and they said that they would like a proposal. They'd like one proposal. They wanted it from the University of Illinois. And that we should identify our international collaborators that we would like to work with us and then come to Seattle and write the proposal. That's what we did. So within a period of six months from when we're first contacted we were funded. BM: Is there a particular timeline on the on the funding from the Gates Foundation? How do you see this progressing here? DO: The first award was for five years, and so we're a bit over four years into that. Now over the past few months we have been interacting with the Gates foundation for reinvestment, and it's virtually certain at this point that there will be an investment for another five years. And there there's certainly the provision and the current, I think, intention of the Gates Foundation is to make this even a longer term project than just another five years. BM: If this is a successful project, if you achieve what you want to achieve what will the results be and when will we start to see those results in fields, whether it be in Africa, whether it be here with crops, when will we start to see those results? RIPE Researcher Ursula Ruiz Vera demonstrates how soybean plant canopies can be adjusted to maximize photosynthetic reactions. DO: Yeah, really good question, and so I think that we've already been successful and so some of the traits that our modeling suggested would improve photosynthetic efficiency that would translate into increased biomass yield, we've demonstrated it actually does do that. And so, now we have those traits, we know how to control them, and we're starting to move them from our model plant into some of these crop plants. So part of in the reinvestment period we'll be moving these into cowpea, as well as the soybean, and into rice. And so I would say that we will probably be field testing some of these things in cowpea and soybean within two years. But going from that point to getting into the farmer’s field is conservatively another 10 years. And so that's why you know when the U.N. says we need to increase food production 70 percent in the next three decades, it's really urgent. Because a breeding cycle conservatively is 12 years. And so we're just a couple of breeding cycles away from, you know, when yields have to be that much higher. And. as you pointed out earlier, it needs to be done in the face of global change. 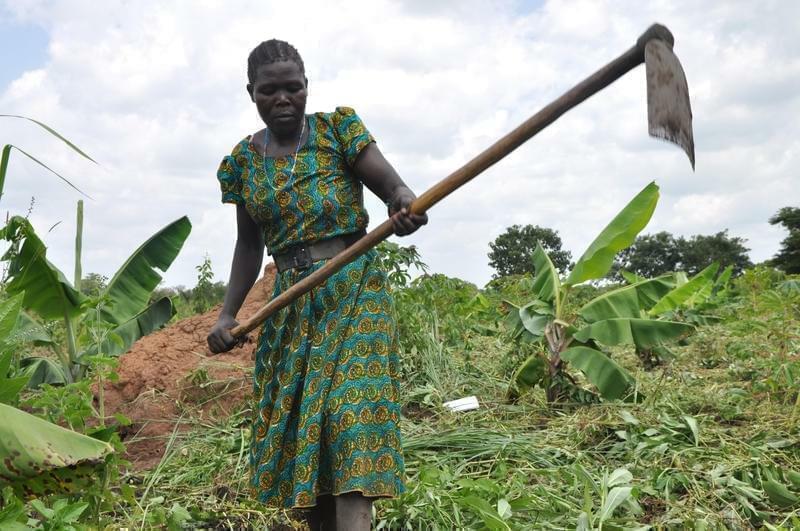 Will St. Louis-Grown GMOs Help East African Farmers Avoid Food Shortages? It’s Complicated.